Software Engineering aims to apply methods and processes for effective and efficient software development. 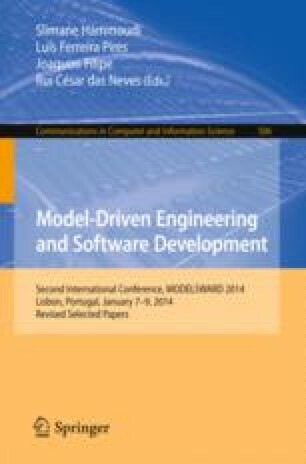 One of the most relevant paradigms for achieving this goal is Model-Driven Development (MDD), which advocates the use of models for automatically generating software products. However, an important issue in the development and selection of MDD technologies is the lack of standardization regarding the features that need to be considered to support the current industry needs. This hinders the comparison of existing technologies since there is no reference point for the creation of new MDD approaches with their corresponding supporting tools. As a solution, this paper proposes a set of main features that MDD tools must support. The set is based on different characteristics that have been acknowledged in the literature, and has been validated by means of an exploratory study with tool vendors. We also present an analysis of how eight industrial MDD tools support these features in order to illustrate the application of our proposal. This work was funded by FONDECYT – CONICYT (Chile) under the projects TESTMODE (Ref. 11121395, 2012–2015), AMODDI (Ref. 11130583, 2013–2017), and from the Research Council of Norway under the project Certus-SFI.